I’m getting close to finishing up an install in my F350 crew cab running an H701 processor. 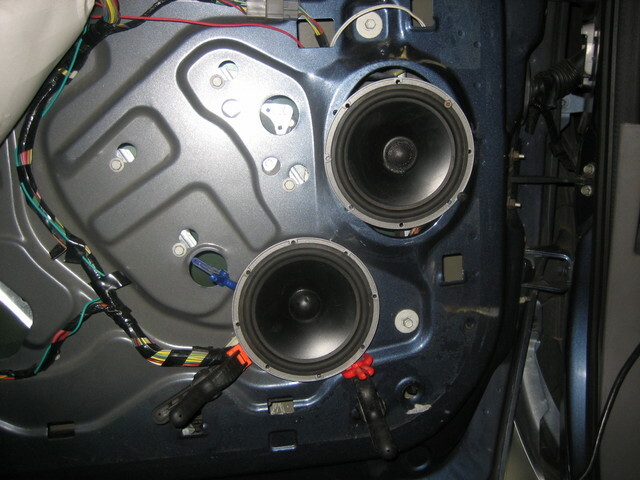 I have a JL XD600.6 to power 2 JL C5-650x coaxial, 2 JL C650 woofers & the tweeters (component set) This will be an active setup. I want to run the 650x’s as just mid woofers. I have been led to believe that all 3 drivers for each channel should be on the same plane for best SQ. I will be sound dampening the doors of course. I re-sized a second hole in the door to take the second 6.5. 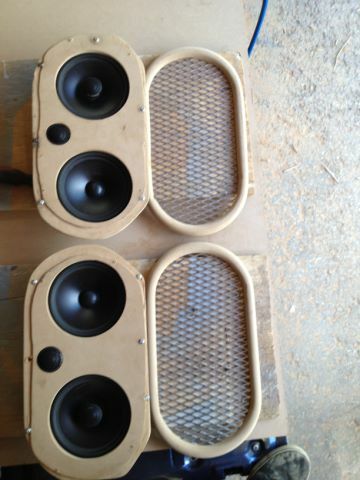 With this design, I would be using the doors as air space for the speakers, is that the best way? so I could reuse the full plastic storage tray I drilled out but then I would have to do “volcanoes” on the doors to mount them and they could have sealed air space (not a lot of it) if I didn't cut out the backs. I’m not sure I really want the volcano look but I would consider it if the speakers should be sealed. I did fab up some backers for them a while ago; they are still lying around here. So what sayeth the experts??? I would love to hear some opinions. Oh there will be an ample sub in the truck as well if that changes anything. Personally, I wouldn't go through that much trouble just to add a second 6.5 driver up front. Whether the two woofers are stacked or offset won't make a big difference in their midbass output so whichever is easier and looks cleaner would be my choice. 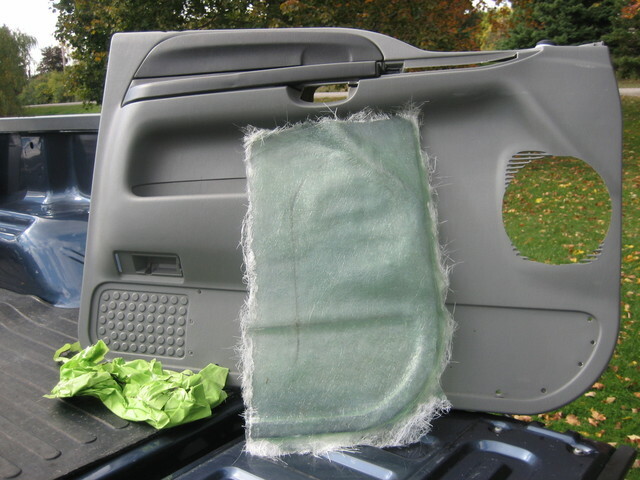 Make sure you seal up and deaden the door skin. Ok, so having them in pods sealed at the back on top of the door with just the airspace of the pods is not recommended rather using the air space of the whole door with them open at the back (as long as the door is sealed up well inside) is preferred, correct? Right. Most car drivers are designed to use a larger air space much better than a tiny one. Isolation of the rear wave from the front is the most important IMO. I agree, make sure the drivers are properly mounted and sealed from rear wave cancellation. Mounting the drivers onto a plinth of wood, which is secured to the door, will yield best results. Using the "pod" idea looks cool but sacrifices SQ in many cases. 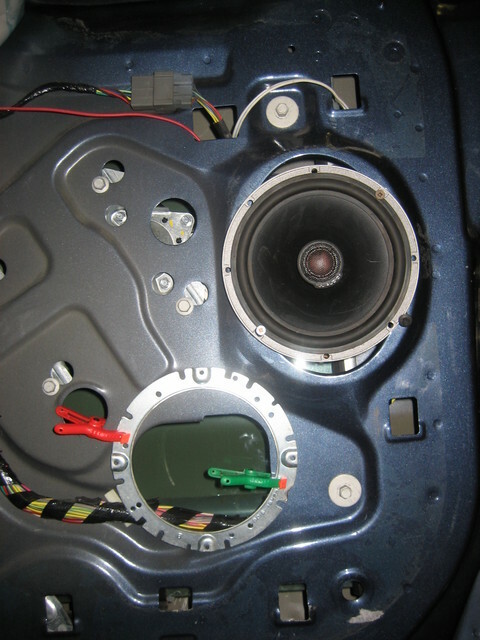 Keep the tweeter within 1/2 the diameter of the woofer, away from the woofer's edge. Thanks guys, I will follow your recommendations. 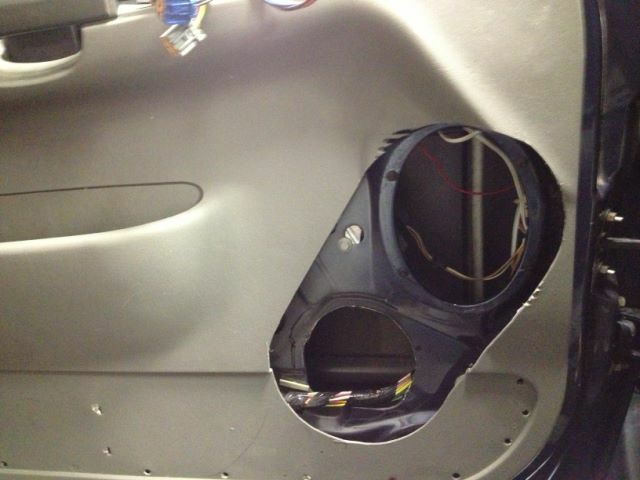 I will use the new hole I created for the second driver so both have the airspace inside the door to work with. What was throwing me off was I know a lot of guys doing SQ setups install in the kicks which will end up in pods. I guess they feel the trade off to get the speakers out of rattly doors and get them closer to on axis is worth the loss of airspace. I have a couple weeks left on the balance of the build (I hope) then this. I will share my build here when it's done. Often kickpanels either use smaller drivers and have a dedicated midbass in the door as well - 3 way setups quite often. For those times a larger driver is used in the KP, a lot of guys find it helpful to vent the pod into the fender or even just into the carpet as a quasi resistance vent arrangement. I hope I'm making the best use of these speakers. The only bridge I'm sort of burning burning is not using the tweet in the coaxials, and just going with the component tweets, the rest is tun-able. To change my plan and start using the tweets in the Coaxials, I guess I would have to parallel or series them with the Component tweeters or install the X-overs just for the coaxials. 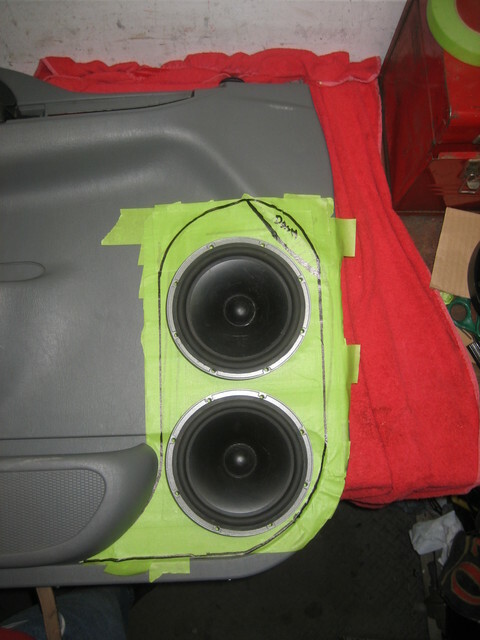 OK, I am almost at the point of installing the speakers, I just need to base/clear the mounts and trim rings. Here is how they will be positioned in the front doors of the truck. They will be 100% clear of the seats firing into the area in front of the seat. I have one coaxial & one component in each hole, my question is how best to configure them? I have 3 equal channels per side from the XD600.6 to work with. Sooo, I would love to hear some thoughts from those in the know. Also, if you could recommend what to cross each of them over at (just as a starting point before tuning) with your recommended configuration, I would really, really appreciate it. I too am in the middle of an SQ system makeover in my F350. I am no expert by any means, by today's standards any way (I too was big on the mobile audio scene in the 80's), so I cannot make any valid suggestions except that since tweeters don't need to be permanently mounted to assess performance, try them both. Temporarily mount them and decide what's best....then mount the one you prefer.